“The images conjured by memory have no dates only seasons, we do not recall the static precision of chronology but the diffuse sensation of a particular climatic mood, the weather’s temperament”. The installation is to be located along the main axis of the school, a corridor of over 100 metres. 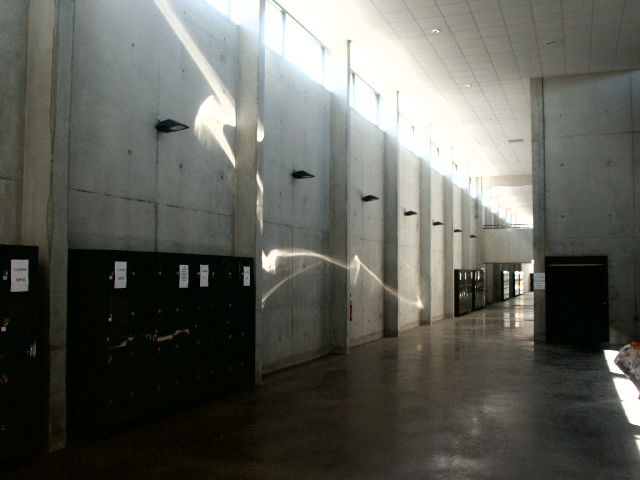 The walls are 7 metres high in cast concrete. Windows run along the top of the wall the length of the walkway. The windows allow a view of the sky and illuminate the walkway. 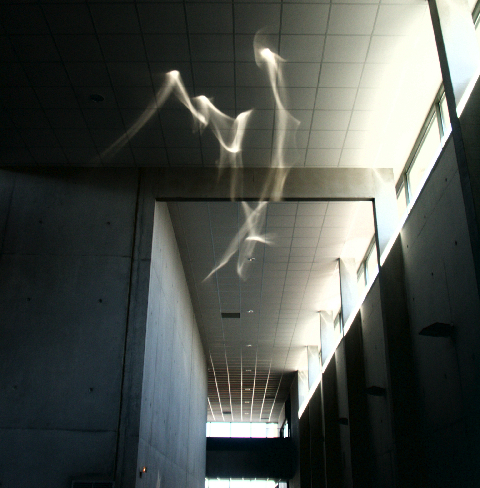 The length of the walkway will be swept by large drawings, in permanent flux, from light projected by ricochets of sunlight off surfaces of polished stainless steel focused on the walls and ceiling. The concentrations and convergence of the sun’s rays will be produced through slight distortions in the steel sheets. Their placement, form and dimensions have been calculated in relation to the sun’s trajectory. 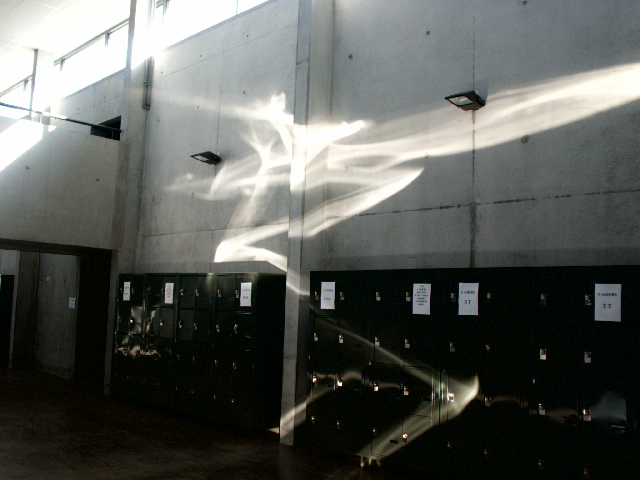 The East/West orientation of the Lycée benefits fully from the 46° shift in the sun’s position in relation to the earth throwing light on to the total length of the corridor throughout the year. The continual variations in position and intensity of the sun’s rays and their ephemeral nature will contrast with the monumental and static mass of the architecture. 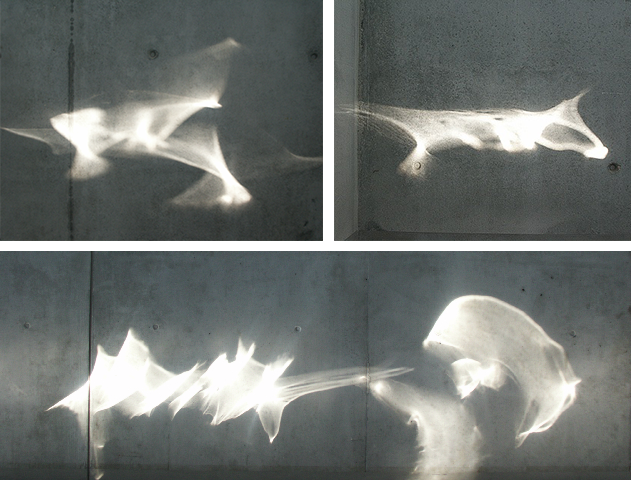 These “sun” drawings take all forms, as concentrated shapes with a three dimensional appearance or more fuzzy like swirling mist when the rays are projected at a wider angle off the stainless steel. No two drawings can be the same, there is no repetition. Overcast weather would bring a more subtle light to the different greys in the concrete, its textures enhanced, bathed in ambient light reflected and projected by the stainless steel sheets. Textures brought to the surface by the light will reveal mini-landscapes decipherable in the concrete surface highlighting micro details within the macro scale of the building. “46°” describes the simplicity and complexity of time through the natural phenomenon of sunlight and the movement of the planet. It is concerned with ecology through its economic use of materials and energy exploiting the architectural treatment of interior and exterior space and it presents vast images as dematerialised; elusive, dynamic and ephemeral.